Karl Lake has over 25 years in the industry. Karl is fully qualified and insured to take on all aspects of paving, hard and soft landscaping projects of a domestic nature. His courteous and friendly service, together with competitive prices, ensure that customers use him again and again for all their paving and landscaping needs. Through structured and more effectively, referrals from his past clients, Karl is fast becoming one of Norfolk’s top paving and landscaping companies. From your initial enquiry through to completed work, KT Lake provides top quality service, offering you a FREE no-obligation quotation, help and advice on planning, our own qualified team of staff, removal of existing materials and through to your finished job. With a 10 year guarantee on all driveways and paving we produce you can rest assured you are in SAFE HANDS! Decorative resin surfacing is a system in which highly decorative aggregates are stuck to a floor surface (such as a driveway) by using a high-performance adhesive (the resin). The completed surface is highly decorative and very hardwearing and provides an alternative to other forms of surfacing such as asphalt, concrete or paving. 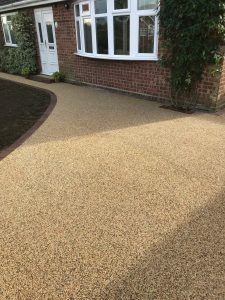 Resin bound driveway surfacing is an innovative surface treatment, with a highly decorative finish that will brighten up any area that is installed. Resin bound can be utilized in a wide range of applications from a private customer to prestige public realm contracts. This cost-effective surfacing solution has a high visual impact using a huge number of colored, recycled aggregates that can be blended and laid in patterns/designs to suit or match any clients needs. Coupled with a UV stable cold applied resin, you can be assured that the visual impact will be maintained for years to come. Resin Bound offers a smooth yet anti-slip surface that is low maintenance, only required to be swept or power washed twice a year to maintain the visual impact and porousness of the product. Driveways, unlike rear gardens, are not isolated, therefore choosing a design that fits in with your property and surroundings in true harmony. However with the use of so many different materials you do not need to conform with the usual schemes and our team can produce a tailored made bespoke design that will make you stand out from the rest. The use of curves can soften, expand and relax the straight lines and hard surfaces usually encountered on a driveway. Curves add a contrast to the rigidity that accompanies the unavoidable straight lines of your home. Choosing colours and material that best harmonises the materials use in your home should bring out the best from your paving blocks. All our driveways are laid on a concrete base and where required, drainage is installed. 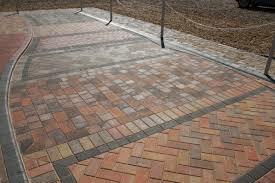 We only use 60mm thick block paving. All our work comes with our 10 year guarantee and is carried out by our own fully trained staff. At KT Lake Paving & Landscaping we can provide you with an excellent range of driveway designs for you to choose from. We have a large product range and can offer you any help and advice that you may need regarding your new driveway. As most people are aware a driveway can say a lot about your property as a new & attractive driveway will help you to increase your property’s kerb appeal and it can also help to add value to your home. At KT Lake Paving & Landscaping we are experts in driveways Norwich & driveways Norfolk, and have an excellent track record. At KT Lake Paving & Landscaping it’s all about quality with our driveways Norwich & driveways Norfolk, we only ever use high quality materials and are consistently praised for our tidiness and efficiency. Our driveway installers are always professional, working and friendly which has lead to us gaining many recommendations from our previous customers. As a company we take great pride in all of our projects no matter how big or small, we specialise in all aspects of paving Norwich and paving Norfolk and will happily answer any questions or offer you free advice. All of our paving & driveway services are available at very competitive prices so please contact us today for more information. A patio can effectively add another room to your house and in turn add value to your property. Effective patio design can make use of your budget with the use of natural sandstone or concrete flags. You can experiment with alternative designs using gravel, bricks, pebbles and tiles to name but a few. All our paving is laid on a concrete base. A well designed and original patio can make you the envy of your friends and make your evenings entertaining much more relaxing. All our patios & paving are laid on a concrete base and where required, drainage is installed. All our work comes with our 10 year guarantee and is carried out by our own fully trained staff. All of our patios Norfolk are installed by our fully qualified team who will be able to take care of all aspects of your new patio from the initial design stage right through to the completion of your project. Over the years we have designed many modern & stylish patios for our customers throughout Norwich, Norfolk and all of the surrounding areas. As a business our main priority is to ensure all of our customers are left 100% satisfied with the quality of our workmanship and customer service. If you would like further information on our patios Norwich & patios Norfolk then please do not hesitate to contact KT Lake Paving & Landscaping today for a FREE quotation. Our patios are all available at very competitive prices and our work comes with a 10 year guarantee so you can have total peace of mind that your patio will last for many years to come. By having your garden landscaped you can free up areas that were previously unusable. This may involve installing retaining walls to hold back higher ground, terracing the garden to provide a series of level areas, or just simply re-leveling a lawn to provide a more useable and attractive space. Landscaping your garden can involve installing drainage, raised beds, in fact all sorts of elements that involves restructuring the garden to better serve the purpose you intend for it.KT Lake Paving & Landscaping offers a fully comprehensive service and we offer advice on design for hard and soft landscaped gardens. From original conceptional ideas, KT Lake Paving & Landscaping can turn your existing garden through to a place that you will never want to leave. Supplying a service that is fully tailored to your ideas and budget.We are proud to be members of The Association of Professional Landscapers. All our work is carried out by our own fully trained staff, for further information on our Landscaping Norfolk and Landscaping Norwich please get in touch.